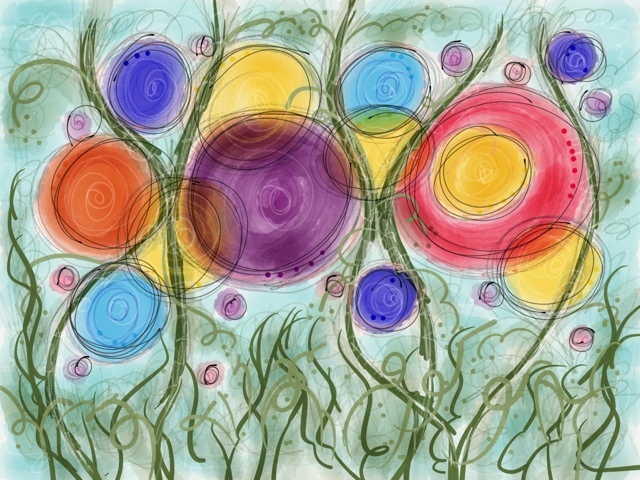 Here's a doodle I created today using my favorite iPad art app: Paper by FiftyThree. I enjoyed layering colors using the various brushes available. I even treated myself to the in-app color mixer tool so I can create my own colors such as the purple and navy blue. Total freedom and fun! Thank you! Susanne, you would love this iPad app! It's all play. I think the app is free, then you spend a ton for in-app purchases, but they are so worth it because you get totally addicted! Thanks, KB! It was totally fun--I used the app I shared with you in October and had a blast!